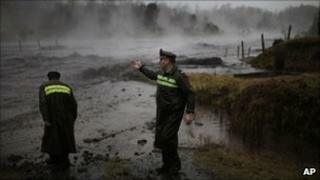 A cloud of ash from an erupting volcano in Chile is continuing to cause travel chaos in parts of Argentina and Uruguay. The cloud has also affected flights in the south of Brazil. Flights from the Argentine capital Buenos Aires, and Montevideo in Uruguay, remain grounded for a second day. Chile's Puyehue-Cordon Caulle volcano range began erupting last Saturday. Many flights from airports in southern Brazilian cities such as Porto Alegre and Florianopolis - some 2,500km (1,550 miles) from the volcano - were cancelled on Friday. But a correspondent for the BBC's Brazilian Service says the situation is returning to normal, as winds blow the fine grey ash out over the Atlantic. A spokesman at Montevideo's Carrasco international airport told the AFP news agency there was a slim chance that planes could start taking off and landing there late on Friday. And the airport authorities in Buenos Aires hope flights can also resume in a similar timeframe, if - as expected - the ash cloud clears. However, several other airports in Argentina - mainly in Patagonia - remain closed, raising fears for the region's ski season, at the start of the southern winter. Workers in the Patagonian resort town of Bariloche have filled 600 lorries with ash that had fallen on the local airport's main runway. Meanwhile, just across the border from Bariloche, in Chile, the volcano continues to erupt. On Thursday, government scientists monitoring the volcano reported a slight increase in its seismic activity. A nearby river, Nilahue, which runs off the slopes of the volcano, has broken its banks, being clogged by ash sediment. Its waters are steaming, having in places been heated by volcanic material to 45 degrees Celsius (113 degrees Fahrenheit). The authorities are worried that recent heavy rains could cause landslides of volcanic debris. Most of the small communities in this area have already been evacuated. But the authorities are putting a specialist police squad together to evacuate the last 14 people in the exclusion area, against the residents' will. This is the first serious eruption of the volcano chain since 1960, when the area was hit by a massive earthquake. Chile is one of the most volcanic countries on Earth. There are more than 3,000 volcanoes dotted along its length, and around 80 of them are active.